Organizing your digital calendar just got a little easier. SignUpGenius is unveiling its latest feature just in time to help with your blossoming spring schedule! Calendar Sync gives SignUpGenius users and sign up creators powerful options to track events and commitments on their personal digital calendars. Sign up participants can sync all the items they’ve signed up for to personal calendars such as Google Calendar, Apple’s Calendar and Microsoft Outlook. SignUpGenius Pro users will get an additional tool: the ability to create a subscribable calendar. Creators who choose this option can allow participants to sync an entire sign up to their personal digital calendars. These calendars can be filtered by “filled” or “unfilled” slots — or show both. Shift scheduling, so all employees can easily see at any given time who is working. Carpools, so parents can see who is scheduled to pick up the kids each day of the week. While you’re exploring SignUpGenius’ tools, be sure to check out our special offer on Pro in honor of Volunteer Appreciation Week. You’ll also be able to assign multiple administrators, eliminate ads, add attachments, access advanced sign up reporting and much more. It’s time to get your spring planning in sync! Outlook behaves a little differently than other calendar programs like Google and iCal. When Outlook receives an ICS file with multiple entries, it opens a new calendar instead of adding those entries to your default calendar. Based on what you described, the issue is that the group member signed up for an event in one time zone (PDT) and the account setting on their personal account is set to a different time zone (EDT). The group member can change their account time zone by clicking *Settings* on the left side of the account page. Next, they will choose the tab for *Other*. Select *Update Settings* to save the updated time zone setting. I created an event and everything is set to our time zone (Pacific). I checked all of the setting in the sign up, and even my settings on the left hand side, clicked "other" and that was also set to Pacific. One of the people that signed up said that when she tried to sync it to her calendar, it gave the Eastern time. I can't figure out how to change it because everything is already set to Pacific. Help! If you chose sync while using your iPhone on iOS11 and can't figure out how to unsubscribe you can unsubscribe from a synced SignUp Genius calendar by going into Settings > Accounts & Passwords and deleting the SignUpGenius calendar account that was created. 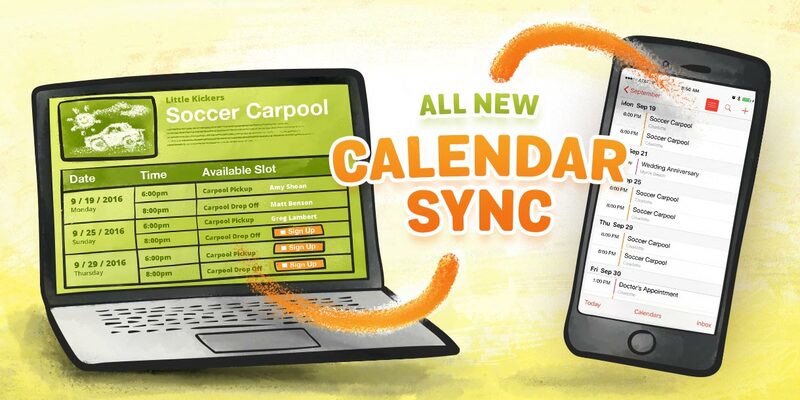 Unfortunately, the calendar account that is created on your iPhone when you choose the "Sync" option will not be available on any of your other devices because it's setup as an Account. You would have to log into that Account on your Mac and every other device. Not sure what the credentials would be? Username and Password and server information required. If you add the calendar by choosing Sync while on your Mac, you can simply right click on the calendar and chose "unsubscribe". If you want to sync this calendar using iCloud it's probably easier to subscribe to the SignUp Genius calendar using your Mac. To sync all items you have signed up for as a participant, log in to your account with your email and password. Go to the *Invited To* tab and click on the *Calendar* icon next to the sign up. From there, you will have the option to add a single event to your calendar or to sync all items you have signed up for to your calendar. I'm happy to explain the difference between Calendar Sync and creating a calendar feed. All users with a free account have the ability to sync all of the items they have signed up for to their personal digital calendar. This is a handy feature because unlike the ics file that is included in the confirmation email (which can be used to add that specific item to their calendar), calendar syncing allows a user to add all items signed up for with that account to their calendar. This includes current and future events. Any changes to these sign ups will be updated on the digital calendar. The Pro feature gives a sign up creator the ability to create a calendar feed. This calendar is typically synced only to the creator's personal digital calendar since most users do not want to see everyone else's sign ups on their own calendar. However, in specific cases, such as employee shifts, carpools, or other types of schedules that need to be seen by everyone on the sign up, the creator can make the calendar feed available to all participants by adding the link to the sign up. I hope this helps clarify the difference between the two types of calendar syncing. If you have more specific questions about either feature, please feel free to contact us directly using the Help tab at the top under More. So is Calendar Sync and creating a Subscribable calendar the same feature? If not the same, are both only available with the Pro version? The intro paragraphs sounds like everyone can sync something they sign up for with their digital calendars, but creating a subscribable calendar is something different and only available with the pro version... Obviously I am confused about these new great sounding features! If you have created a sign up and wish to sync all of the dates to your Google calendar you can create a calendar feed that you can upload to your calendar. Please note that this is a Pro feature. Once the calendar feed has been created and you have clicked the "Subscribe" button, you can choose the Calendar Help button to show specific details about synching to specific calendars. How do I sync my sign up genius to my google calendar using my computer? This is something you need to do from within your calendar program. Each calendar program will have a way to unsubscribe from a calendar feed, usually from within the settings or by editing "Other" calendars. How do I un-sync the calendar from my computer?